Using LIC Online Payment facility, one can pay premiums online within minutes whether they are a registered user or not. The LIC Premium Online Payment will save your precious time visiting LIC branch offices. The complete step-wise procedure of online LIC payment will make your premium payments hassle-free. So, Let’s go through the following sections of the article to know more about How to pay LIC Premium Online? Life Insurance Corporation of India is the leading life insurance company in India. LIC is a public sector Insurance company. People have good faith and trust on LIC because it is controlled by the Indian government. But, when it comes to the services and extra features provided by the LIC is behind their own complements. In previous days, the premium amount should be paid through LIC agents or visiting the nearest branch office. But today in this Busy Life, it is very difficult to go the branch Office for LIC premium payment. Hence, to reduce the effort to their policyholders, LIC India has started this online payment services for paying premium amount. Still, most of the policyholders are not aware of the LIC Online Premium Payment, and they still depend on the LIC agents. So, for those individuals, I have provided the online lic payment steps in this article. This website explains you the procedure of LIC Online Payment through Debit Card and Credit Card in detailed steps. We hope after going through this, people may find easy to pay the premiums online without any hesitation. Most of the people think that Payment of LIC Premium is done only through agents or directly by going to the LIC office. But, paying LIC Policy Online Payment, from the official website would be tension free and saves your valuable time. This is the reason LIC has provided this online payment provision to make their customers more comfortable. Moreover, you can pay many policies in the single account (but it is not recommended by LIC). You can read the following steps to make the LIC India Online Payment. By following these Simple Steps you can make the LIC online premium payment with just a few clicks on your PC from anywhere in the world. LIC is offering online payment service for both Registered and Non-Registered Users. 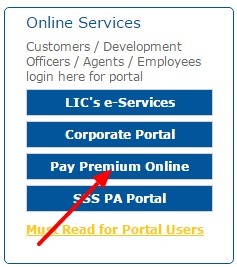 Now you can pay your LIC policy Premium online, with just a few clicks on your computer. LIC has made life easier for the infinite LIC policyholders across the country. LIC Payment Online option is initiated to save time and money of the clients. In this Article, we have given the LIC Online Payment Steps for both Registered and New Users. Check those Simple Steps and Pay your Premium through online. Also with this new service, the Insured can get the payment instructions within the comforts of their home or office, and avoid a personal visit to LIC branch. While making payment, you can also check your LIC Policy Status. Hence, go through the following sections of the article and enjoy the Online payment service of the Life Insurance Corporation of India and save your precious time. 1. Go to website www.licindia.in or www.lic online payment or www.lic of India online payment. In the Home page, search for Online Services section located on the left side of the homepage. 3. Select Pay Premium through e-Services option. Now, you will redirect to LIC’s e-services page. 4. 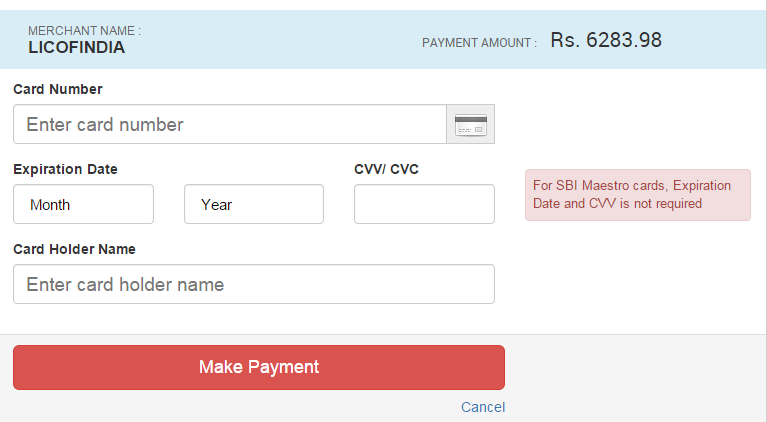 Now Click on Registered User option as shown below. 5. 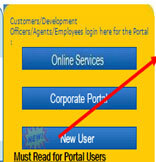 By Clicking the Registered Users option, a different page appears with LIC log in I.D and password fields. 6. You need to fill the User Name and password details in it and click on Submit option. 7. Once you login you need to enroll your policy to retrieve your policy details. 8. In the left side menu, you have an option “Enroll policies” under e-services tools section. 10. Then a page appears with a Code as shown below. Please fill the code as shown in the image and click on submit. After that, you will be able to see all the details of your policy. 11. Once you enter the above online services portal, you will be able to view the enrolled policies. For more information, Please click on the policy number. Then a page with complete information appears before you as shown in below image. 12. After viewing the policy details, In customer service, you will be able to see an option “Pay Premium online” to make the payment online. 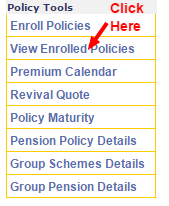 Click on the “LIC Pay Premium Online” link, and you will see a list of policies you have enrolled in your account. 13. 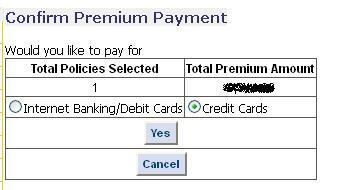 Select the policies which you want to enroll and click on the submit button. It will be landing to the payment gateway site where you will be making the payment. Once payment is done, you will be returning to the same web page. 14. Initially, there is no provision to pay the LIC premium using the credit card. But recently LIC has provided an option to pay Online Payment of LIC Premium by Credit card too. 15. Once you have clicked the submit button, the next screen will show you the option to pay through credit card or debit card. 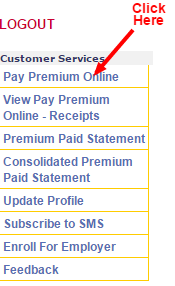 Click on that option to which you want to pay the LIC premium. 16. After selecting the type of card, a list of banks will display on the screen. For LIC Premium Payment, the customer has to pay the convenience fees and service tax to the LIC for processing the payment as per the table shown below. Based on the type of card you have selected, the list of banks appear. Select the Bank and click Submit button. Then the below page appears. 17. 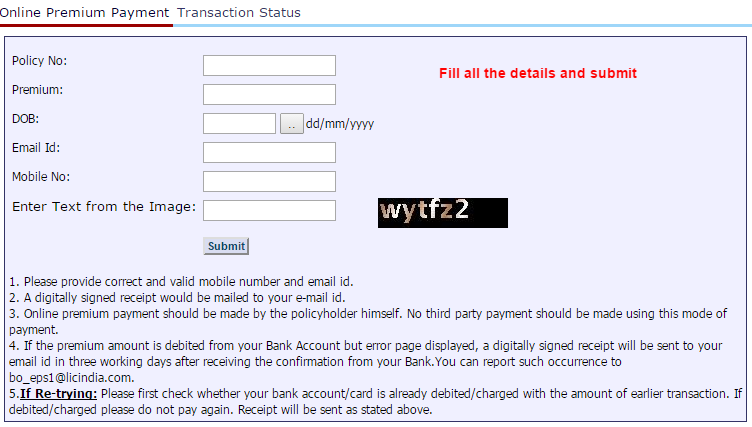 Fill all the details and click on Make Payment button, your payment will be processed. You can view the LIC Online Payment receipt anytime. It is one of the advantages if we are making the payment online. We can keep the receipts safely and take the printouts any time. The copy of the LIC Premium Online receipts will be sent to your email-id that was registered with your policy number. Life Insurance Corporation of India has created another new facility called LIC Premium Payment without Registration. Forgetting the password for the log in page to pay LIC premium is a common thing. The reason is that we regularly not log in to this page as our premium will be either yearly or half yearly. So, the corporation has come up with one more facility where there is no need to register. 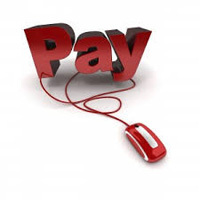 Instead, we can pay online directly without any hassle. Hence with this method, you can Pay LIC Premium Online from any corner of the world. 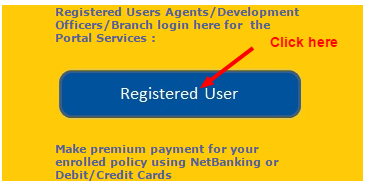 The LIC Online Payment New user registration steps are as under. 1. Go to website http://www.licindia.in/ or www.lic.online payment or www lic online payment. The Home page of LIC India will display on the screen. In that, search for Online services section available at the left side of the home page. 3. Since you are a non-registered user, you should select “LIC pay direct” option for LIC Online premium payment. 4. Now, you will redirect to a new page as shown below. 5. Please fill all the details required such as Policy Number, Date of Birth, Mobile Number, Email Id, etc. in the above screen and then click Submit. 6. Once you enter these details you will redirect to the payment page, where you can pay the premium amount as per your convenience. 7. Therefore, on successful payment, a digitally signed LIC Online Premium Payment Receipt will be mailed to your email id. Keep it as proof of your payment.